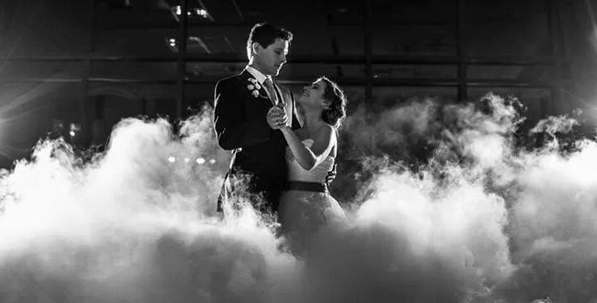 Dancing on a cloud adds that magical touch and makes for amazing First Dance pictures. If you are great dancers it will take your first dance to another level. If you aren’t the best dancers in the world it will make your first dance special without adding the pressure to impress your guests with your moves. You will be amazed on how many pictures your guests will take of your first dance. With this new special effect. The cloud is produced with the use of heated water and Dry Ice in a professional theatrical machine. It takes a little more than an hour to heat the water and the effect will last for your first dance. It will not set off smoke detectors. There is no odor to the cloud, unlike other fog machines. There is no moisture left on the dance floor because dry ice goes from solid to gas when activated by the hot water. As a DJ and Lighting company contracted to produce the entertainment portion for Weddings, Corporate events or any type of celebration, one of our biggest responsibilities is making the event memorable. If at the end of the night your guests rave to you about how much fun they had, or even years later mention how great your Wedding was, then we know we did our job! Many of our online positive reviews reflect this, how our client’s guests could not stop talking about what a great time they had at the reception, or how much they loved the lighting or snow during the first dance, or even the low-lying fog effect … regardless of which they moment they loved the most, the job of an entertainment company is to “wow” your guests from the moment they step in the door. Dancing on a Cloud or Dancing on Clouds is a “special effect”, accomplished by utilizing a dry ice machine, which, when loaded with steaming water and dry ice produces a thick white cloud of smoke resembling, well, a cloud! A CO2 tank can also be used, but are reserved for theater or other events where you need the cloud for longer than 4 minutes. During Weddings, Dancing on a Cloud is used during a first dance or parent’s dances, for Sweet 16s they are used during the father-daughter dance or even during the dance with the boyfriend. During Halloween parties, they are used throughout the evening to give it that “Spooky” effect, further enhanced with black-lights. A professional theatrical Dry-Ice machine is small in size and black in color, so as not to be intrusive. It is usually filled with 5 to 10 gallons of steaming hot water so it must always be monitored by someone, and it is activated by loading it with approximately 20lbs of dry ice. I prefer to use pellets as they evaporate less quickly (although this is an ongoing debate between myself and dry-ice manufacturers which has not been verified), and pellets are also easier to handle. The machine is loaded approximately 5 minutes before it is set to be used, and rolled to the side of the dance-floor, away from view, where it is activated at the discretion of the operator. It can emit smoke for a full four minutes, or as we prefer to use it, turned on during the climax of the song, as a surprise. This way your photographer can get pictures with and without the effect. So no matter what we get the “perfect shot”. Q. Is the smoke that comes out of this machine hot? A. No. It is cool and created by condensation … just like the fog you see in nature. Q. Is it safe for people with medical conditions? A. The effect uses dry-ice, which is solid carbon dioxide, dipped into hot water. These are the only two items required to create low-lying fog! There are no chemicals, additives, oils or any other items which may trigger a condition. But please always consult with a doctor. Q. Can this set off fire alarms? A. No, the fog stays low to the ground and does not rise above your knees. With that said, the alarm systems at some venues are very sensitive and can possibly detect it. We have never had an incident where low-lying fog has set off any alarms. Your venue manager would be the best person to ask. Q. Does it cause a slippery condition? A. Marble or similar floors will become slightly damp but unless your first dance involves a tap-dancing number, most floors are totally fine.